Massive smoke plumes from the record-breaking 2017 North American wildfires affected Earth’s atmosphere like a volcanic eruption does, according to a new study published in the journal Geophysical Research Letters. The overall impact of the 2017 North American fires on the stratosphere surpassed all other documented wildfire events since the beginning of stratospheric observations in the 1980s and had an effect equivalent to a volcanic eruption, according to the study’s authors. Watch as smoke plumes from North America’s 2017 fire season dissipate across the northern hemisphere. In just a few days, the plume’s contents spread across the globe and back again, covering thousands of miles in just a short time. Bane describes why the 2017 North American wildfires were uniquely powerful and how the smoke moved through Earth's atmosphere in fascinating detail. 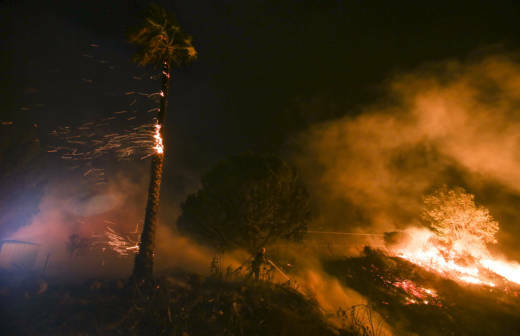 The authors of the study hope their findings will lead other researchers to pay more attention to the effects of wildfire pollution on Earth's atmosphere. Last year's wildfire season was one of the most destructive in recent history, destroying millions of acres throughout British Columbia, California, Montana, and Oregon. Massive recovery efforts included about 28,000 personnel, 1,900 fire engines, and 200 active-duty military personnel, according to a Mother Jones report. A KQED investigation into the causes of the wildfire and the emergency response is airing this week at 6:22 a.m. and 8:22 a.m. on FM 88.5.